Portable and convenient, the Fall Protection Roofing Kit 20058 complies with OSHA 29 CFR 1910.66 and 1926.502 regulations, and meets the requirements of ANSI Z359.1-2007 standards. 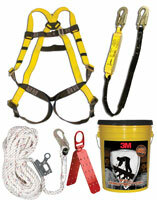 The kit contains a SafeLight universal harness, an energy-absorbing lanyard, a reusable roof anchor and a 50-foot rope lifeline assembly with a manual rope adjuster. A storage bucket with a lid also is included. 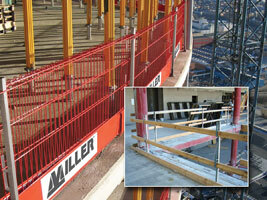 The SafetyRail 2000 fall protection guardrail system meets and exceeds OSHA regulations. It is portable and non-penetrating, and meets OSHA guidelines for a permanent guardrail. The base is designed with four ports that allow infinite positioning of the rail sections. 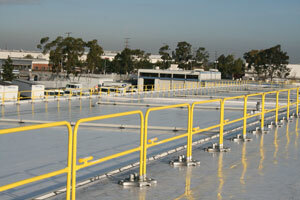 The system is ideal for roof edge fall protection, mezzanines, warehouse floors, construction sites and more. The 85- and 130-foot Sealed-Blok Self-Retracting Lifelines are designed to withstand the harshest operating environments and include features that maximize worksite versatility and lower the cost of ownership. They are the only sealed self-retracting lifelines available with a retrieval winch for raising and lowering personnel or materials. 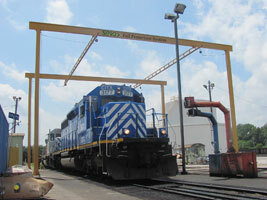 Fall Protection Systems Corp. specializes in applications for trucks, barges, aircraft, railcars and more. Fall Protection Systems will travel to jobsites free of charge and conduct a site survey to custom-design a solution for fall hazards. 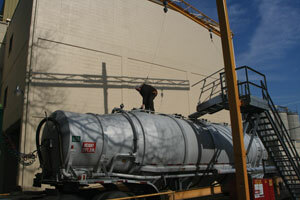 The turnkey quote provided includes the engineering, freight, footings and erection. 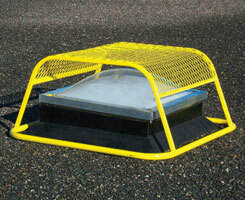 The Sky-Dome is a completely freestanding system for temporary or permanent skylight fall protection. Simply set it in place and walk away – no drilling, screws or mechanical attachments to the roof or skylight are required. It complies with OSHA 1910.23(e)(8), (a)(4) and 1926.501(b)(4). Systems stack for easy transport or hoisting to the roof. Unistrut’s rooftop fall protection systems include engineered lifeline systems, energy-absorbing anchors and freestanding safety roof railings. 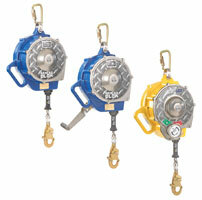 All of these systems are engineered and tested to meet or exceed various safety standards such as ANSI, CSA and OSHA. Typical applications include rooftop safety for maintenance, mechanical unit repairs, roof hatch and solar system maintenance. The LiftPod FS60 has the portability of a ladder with the stability of a work platform. It increases productivity, as one worker can complete tasks with a 360-degree range of motion in an enclosed platform. The FS60 features a 12-foot working height, an attachable work tray that holds up to 33 pounds of tools and a 330-pound-rated platform capacity. EPIC Barrier Systems are most commonly used in building construction and elevated areas where workers are exposed to edges. Engineered for quick and easy installation to reduce labor costs, the barriers are available in three safety systems, including a post and lumber design, a post and steel mesh barrier, and an impact-absorbing steel mesh design. The Workman Twin Leg Personal Fall Limiter increases worker productivity by providing greater mobility and continuous connection while moving from one location to another. Simply insert the back D-ring into the slot, and you are connected and ready to work. It also features a patent-pending ARCA harness connection. The Portable Monorail Fall Arrest System delivers fixed-path fall protection that is completely portable using either a forklift or the optional steerable rolling chassis package. Ideal for applications in air, truck and manufacturing transportation, the system is designed for workers up to 400 pounds when used with 900 maximum arrest force energy-absorbing lanyards. No welding is required. This turnkey service provider of cable, rigid rail and custom fall protection systems works with its customers to design and engineer systems that meet all applicable regulations at a cost-effective value. 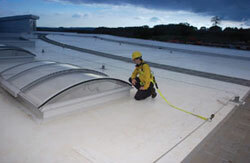 It also provides customized employee training for all types of installed fall protection systems.